Facebook’s stock price soared after its late July earnings call in which it beat Wall Street expectations and showing that mobile advertising was making a profit. After years of the industry struggling with how to make money off of the limited screen real estate offered by smartphones, Facebook appeared to crack that nut. Revenue from smartphones and tablets made up 41 per cent of its total advertising revenue, hauling in $655.5 million dollars between April and June. Along with its impressive profits, Facebook has been winning praise from marketing analysts for its ability to effectively execute on display advertising on the Web too. A symbolic win for the world’s largest social network occurred in April when General Motors came back to advertising on the site, about one year after pulling its ads and saying they weren’t working. So should marketers and advertisers buy in to social media ads? Sure Facebook’s making a buck, but does that mean that people are following through and buying products as a result of these ads? It turns out that many of them are – just not so much in Canada. In a poll conducted by Ipsos OTX of 18,150 respondents in 24 countries, the results were mostly quite good. 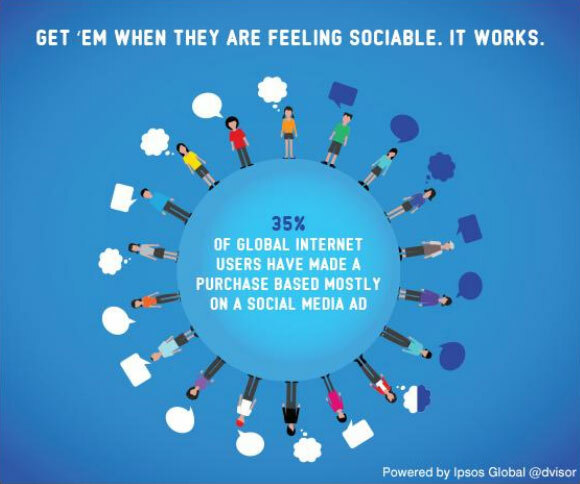 More than one-third (35 per cent) of Internet users worldwide say they’ve made a purchase as a result of an ad seen on social media, according to Ipsos Global @dvisor. Also, 31 per cent laid done some cash after reading a post on social media. BRICS nations came out as the most likely to be influenced by social media advertising. Brazil was on top of the list with 69 per cent making a purchase after seeing an ad, and 66 per cent after seeing a post. It’s followed by Indonesia, Mexico, India, Turkey, and China. But the developed world was less affected by social media ads, and particularly Canadians seemed almost immune to these messages. Just 13 per cent of Canadians made a purchase because of an ad, and only 10 per cent because of a post. Only respondents from Great Britain scored lower than that. Not surprisingly, the under-35 demographic was most likely to make a purchase as a result of social media.